Last month marked the 10th anniversary of the start of the Iraq war. Many commentators used the occasion to discuss the lessons that we should have learned from this ill- conceived foray that cost tens of thousands of lives and trillions of dollars. Few mention the most striking failing; the one thing that may keep leaders with macho personalities and little common sense from repeating the same mistake. Whenever military action is contemplated, the government should be required to raise taxes to cover the full cost of the war it wishes to wage. 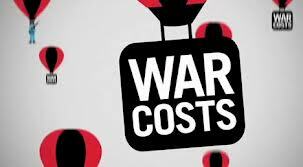 If the initial estimate of the war’s cost is exceeded, our leaders would have to convince the bill-paying public that further spending is warranted and raise taxes accordingly. Such a sound fiscal policy would prevent the government putting war costs on a credit card so that the country can have both guns and butter – the proverbial free lunch. It would also avoid encumbering future generations with huge debts. The commander-in-chief would be forced to persuade all citizens, not just the military, why they should sacrifice their hard-earned money to prosecute the war. Had this process been instituted during the Iraqi war, as well as other incursions, it is unlikely the war would have lasted as long as it did. Some wars may not have even been started. It was patently obvious to many objective observers that the post WWII offenses would require sacrifices that were likely to be much greater than benefits obtained. If military action is thought necessary, politicians should be able to explain the need to sacrifice both the lives of its troops and the treasure of its citizens. If they can’t war plans should be shelved. War seldom accomplishes anything of lasting value. Not going to war may indeed be the ultimate victory. This entry was posted in Blogs On Current Affairs & Events, Leadership, Money, Political and tagged budget deficit, debt, defense spending, Iraq, taxes, war. Bookmark the permalink.